I took the photo that inspired this painting last year, on a cold day at the beach. I didn't get around to painting it until this year, on an extremely hot day at home. Looking around at the finished pieces and works in progress sitting around my kitchen, I realized that every one of them had a common element: water. Even my landscapes have a bit of water in them. I thought back to my high school days, when I first really tried to make paintings of my own. I remembered that they usually had some water or waves in them too. I don't live near water, but it's not too far to drive to the beach. I'm also happy to paint swimming pools, ponds, and lakes. I'm not sure what it is about water, but a painting feels much more comfortable to me if it has some in it. 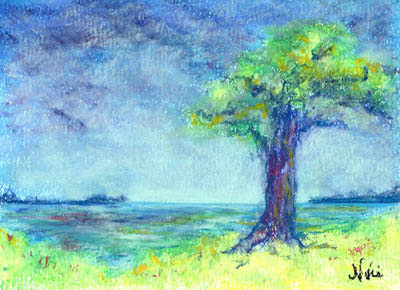 Dreaming of cool evenings, I took out the oil pastels and sketched in a tree, Then I added a little bit of sky and water. I really just wanted to give myself a color exercise, but it turned into a full painting. After I filled the paper with a full oil pastel underpainting, I used light watercolor as a wash to fill in color over some of the whites. 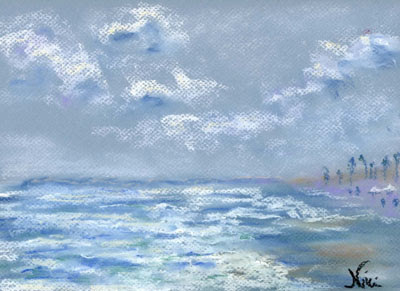 Once that was dry, a layer of chalk pastel completed the piece, giving it that soft, textured look. I stuck to a lot of blue and purple, using a bit of green to suggest the leaves of the tree and the grass. A little red and yellow-orange in the clouds lent a bit of warmth and variety.